Coffee making at our place has just levelled up! We’ve just acquired a De’Longhi “Decida” espresso machine. This is a nice little machine that’s got the neat feature of accepting either regular ground coffee or standard ESE coffee pods (more on that later). It’s a handy size for a small kitchen, it’s simple to use, it looks nice, and so far I’m really happy with the coffee it puts out. If you’re in the market for a small “real” coffee machine and you’re in NZ, Harvey Norman have them on sale for NZ$227 at the moment, which I think is a bit of a bargain (RRP is ~NZ$400). A minor design point that I liked – when the drip tray is full, the red plastic bit floats up and it sticks it’s tongue out at you :p.
Previously we had a Lavazza “A Modo Mio” pod-based machine, which was handy, but it’s starting to show its age, and the facts that (a) it was purely pod based, and (b) you can’t buy those pods in NZ (so we were mail-ordering them from Australia or the UK) made for a rather environmentally un-friendly cup of coffee. I wasn’t aware of the ESE standard (yay, open standards!) before researching this purchase, but I’m really glad to see it exists, since (a) you’re not locked into only the machine’s manufacturer’s range of coffee and (b) it offers consumers a way out of the “razor and blades” business model for coffee pods. The most egregious example I’ve seen of this for coffee being the “Lavazza Blue” range – you get the machine for free, but the pods are about 2x the normal going rate! PS, apologies that it’s been so long since I last posted. So, some of our friens moved from London to Berlin recently, exciting! Jo’s been blogging about the experience which makes me realise I’ve not really written much about my and Juliet’s move from London to Auckland. We’ve been here since October 2011, so 2½ years now. Not a problem here, which is really nice. For whatever reason, dog (ahem) mess on the street is amazingly rare here, I’m not sure why. I think dog ownership rates are comparable with the UK, but I literally can’t remember the last time I saw it on the street. Maybe people usually walk them elsewhere? Also, it’s not uncommon to see young guys walking around barefoot in the middle of town, which kind of boggles my mind – broken glass on the street is pretty rare here too, fortunately. Not much of a problem, because there’s hardly any cyclists. Cycling is becoming more popular in Auckland, but it’s from a pretty woeful baseline. This is partly because Auckland sprawls and also loves its cars, but also it’s a hilly city. EFTPOS (NZ specific debit cards) is accepted pretty much everywhere here and is quick and convenient (so using it in the pub doesn’t get you dirty looks). I think the EFTPOS system must impose lower useage charges on the retailer, because even paying for a loaf of bread in the dairy (corner shop) seems to be no problem. But best to do it in summer (December-February, or a month either side if you’re feeling lucky). The Auckland summer seems pretty much endless – it was shorts + t-shirt weather pretty much every day between November and the middle of April, but it’s finally moving into autumn now. I have found the winter here a bit of a drag – the weather’s not too bad (mostly like UK autumn), but not having Xmas / New Year to break it up means it also feels endless. The suggestion of a national holiday for Matariki (Maori new year) would be a good plan. Due to our free quickflix account, John and I we have started watching old BBC series, including House of Cards (“You may say that my dear, but I couldn’t possibly comment”), Blackadder and Cracker. It was here I stumbled upon my new style icon, Judith (Barbara Flynn), Fitz’s wife in Cracker. Its not the hair, the clothes or the attitude, its the earrings. So 90’s, big and full of personality. It does make me wonder though, whether there are any other gems in 90s fashion? I bet not many though. Normally I’d go for more NZ pale ales, since there’s so many good ones, but it being winter I was looking for some English-style bitters. I was a bit disappointed that LiquorLand in Newmarket didn’t seem have any UK beer in at all (last time I was in it had the usual suspects like Hobgoblin, London Pride, Greene King IPA), but I’ve picked up a few local brews that are English or Scottish style ales (the German wheat beers are Juliet’s choices). Oh, and if you’re on Untapped, add me. Cheers! So, spurred on by nerd-rage at the Google Reader shutdown I finally got around to migrating this blog from Blogger to a self-hosted WordPress site. So, how are you getting on with your Google Reader alternative? I’ve not made the jump yet, since there’s still a couple more months till the service shuts down. feedly.com is a popular choice, but I’m wary of the fact that it doesn’t support any way of exporting your feeds (other than Reader), and that it’s not web based. Self-hosting it with Tiny Tiny RSS is one option, but I wonder if I can be bothered with the potential hassle involved. My preference would be for a similar web-based service, similar to Reader, and also for compatible Android reader and podcast listening apps (to replace Listen). One nice feature of Listen is that it syncs feeds with Reader so you can add new podcasts feeds to be synced to your phone purely by adding it to the web interface. Free would be nice, but it’s not absolutely required. Rip-off tour photos – bad marketing? Is selling eye-wateringly priced photos really a good strategy for adventure tourist attractions? I’ve done various day-trips that for want of a better phrase I guess you could call “adventure experiences”, most recently the Shark Dive at Kelly Tarlton’s (Auckland’s aquarium) and the Auckland Sky Tower walk. These are small-group guided trips taking a few hours, doing something quasi-adventurous, aimed at backpackers and young(ish) people, and are generally quite a social experience. They’re really common in NZ and Australia – the first time I remember encountering this sort of thing being the Sydney bridge walk a few years ago, or maybe rafting trips around the same sort of time. Now, don’t get me wrong – I’ve really enjoyed all of these trips, but there’s something that annoys me a bit about them. It seems to be a common business model for the guide (or another staff member) to take photos and video during the trip, and at the end you’re offered a package to buy them – either on a CD or more often these days a USB stick. The sticking point being that the asking price of the photos is usually a pretty hefty fraction of the cost of the whole trip. What bugs me about this approach is that the price of the photo package isn’t discussed beforehand, and since as I said these trips are quite social, it feels like a bait and switch when at the end of the trip the guide is doing a sales pitch for the photo package – it leaves a bad taste in the mouth, and it often seems disproportionately expensive, especially when there’s not been a dedicated camera-person. I would guess that the proportion of people who buy the photos tends to be fairly low – I know personally the only time I remember doing this was for the Shark Dive, and like I say it does make me feel ambivalent about what is otherwise generally a great experience. Earlier this year we did a trip in the Bay of Islands called “The Rock” – an over-night back-packer focussed boat trip from Pahai involving a bit of everything – fishing for Snapper, kayaking, night swimming, diving for (and eating) sea urchins. This was fantastic fun, one of the best of these sorts of things I’ve done, and definitely the highlight of our time in the Bay of Islands – don’t miss it. What these guys do is, rather than try and sell you a photo package, is put the trip’s photos up on their Facebook page – this is a nice approach, since you don’t have the annoying sales pitch, and it generates good word of mouth for them, since the natural thing is to Like their page and say something nice about your trip – instant social marketing. It’d be great if a few other companies took a page out of their book and did the same thing. I can see it might be a tough call for them, to choose between the quantifiable short term gain of selling a few photo packages and the harder to gauge benefit of good-will and increased word of mouth but I’d like to think it would pay off. So this morning I gave the concept of fizzy coffee a go. I’d initially thought about putting soda-water through the coffee machine but I thought there’s a reasonable chance that this could destroy the machine and possibly my marriage, so I’ve gone for the less exciting approach of mixing the drinks after production. Full-flavoured, rich and well rounded. The magic of this great blend captures all of your senses in a moment of complete excellence. Great body, well rounded and a richness of roasted aromas produces an exceptionally full flavoured coffee. It is an authentic blend for savouring all the intensity of a Café Bar experience. 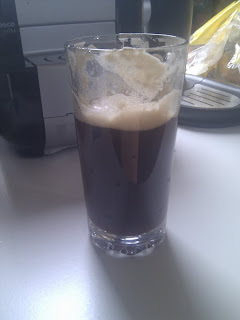 Due to impatience I started with hot coffee, pouring it into an equal volume of soda water in a tall glass. First of all this produced a mess – a massive head of brown foam, plus a fair bit of coffee on the counter-top since our espresso cups aren’t really designed for pouring. With a bit of stirring the bubbles cleared and I was able to pour in the rest of the coffee and top it up with soda water, so probably ending up at a ratio of water to coffee of ~1.5:1. Not great to be honest – the very strong soda taste overwhelms the coffee flavour. Also as evident from the amount of foam it’s lost most of it’s fizz. And the frothy head has a slight weird-brown-foam-on-the-beach association to me. Overall not completely undrinkable, but not nice, 1 out of 5. I think part of the problem here was that I used hot coffee. Warming the soda-water will have reduced the solubility of CO2, leaving the result un-fizzy and producing the massive head in the process. Yeah, science. I did think that this might happen beforehand, which is why I went for maximum fizziness in the water, but the side-effect of this is the overwhelming soda-water flavour, which kills the coffee. If I try this again, I’ll use cold coffee, as suggested, and less fizzy soda-water. In Eclipse, using the Google App Engine Tools v2.4 beta (ms1), and following the example in the demo video, I’ve created an “App Engine Connection Android Project” called “TubeMessage”. Out of the box this functions as a simple messaging app, so it seem like a lot of the work has already been done for me! While setting up this project I also registered the app for C2DM access – this is needed in order to use C2DM to associate the app with Google accounts. My first deviation from the demo video has been that I wasn’t able to log into a google account from the Android emulator – I fixed this as per this StackOverflow answer – First install the Google APIs (API8, since my real phone runs Android 2.2) via the Android SDK and AVG Manager, and then created a new virtual device with Google APIs as the target, and also changed the TubeMessage-Android’s target (Properties -> Android) to be “Google APIs”. So, I’m teaching myself how to write Android apps. I’ve got Hello World under my belt, and for my first proper app I’m going to scratch an itch: offine support for online apps. I play various games on my Android phone as I commute to work on the London Underground (WordFeud is a current favourite). Naturally, for a large portion of this journey I don’t have network access, and I’ve wondered why there don’t seem to be any games that allow you to make moves while offline and transmit them automatically when online. Is there a technical reason why this is particularly difficult? It’s obviously not impossible, since both the built-in Mail client and the GMail app support this. Inspired by this talk from Google IO, I’m going to implement a simple messaging app using Google App Engine, and then add off-line support for it.